My foot measures 3 1/16 across. I usually wear 7.5-8 in ladies shoes. What is my foot width? Is it AA or A? This matters a great deal as AA is often pinching and B is swimming on my foot. Please help! Even though there should be a size between AA and B (A is essentially the same as AA or 2A), there currently isn’t. You are on the right track by testing out what works for you. In the meantime if a shoe is too small and the result is discomfort, I suggest getting the next width up. I would also take into account if there is any extra padding available in order to compensate for the bit of extra space in the shoe. Here is a lovely shoe that could work for you. Why is it so hard to find 10.5? Well Lisa it’s hard but not impossible! Their existence shows that there is a need. It is hard to find most half-size shoes in every style. The reasoning goes back to the manufacturer. It is easier to try to fit someone into a whole size that might be a little too big (or too small in some cases) than it is to mass-produce shoes to fit the unique qualities of every foot. What I have found is that even though I look for my target size, it isn’t a guarantee of a perfect fit just yet. One will always have to factor in the style and shape of a shoe, as well as the length, width, and volume of one’s feet. Generally people can wear a bigger size of sneaker due to the extra padding, but look for a ballet flat that is true-to-size to make up for the lack of extra cushioning. 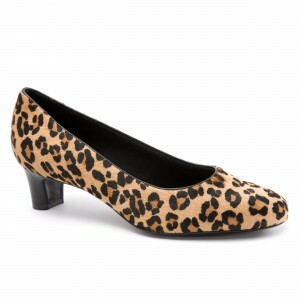 One of my favorite new shoe arrivals available in women’s size 10.5.